Subhash Chandra Bose was the adversary of Ghandi who rejected the exclusive use of non-violence and organized the Indian National Army an armed struggle against British colonialism in India. 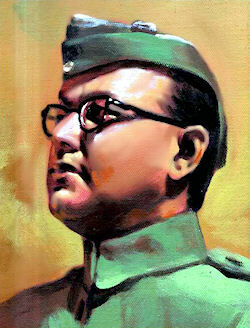 Subhas Chandra Bose, affectionately called as Netaji (Hindi: “Respected Leader”), was one of the most prominent leaders of Indian freedom struggle. Subhas Chandra Bose’s had frequently been imprisoned by the British in India, and his hatred for Great Britain was violent. He had long argued that there was no hope in the policy of compromise with the British which Gandhi was following, and that Indian independence could be achieved only by force. Bose, an energetic and persuasive speaker, was probably most popular with those Indians who had some previous contact with political agitation or who came from his own province of Bengal. There Bose had won his largest following as one of the most turbulent and conspicuous of the nationalist leaders in India. Though Mahatma Gandhi and Jawaharlal Nehru have garnered much of the credit for successful culmination of Indian freedom struggle, the contribution of Subash Chandra Bose is no less. The BJP president, Lal Krishna Advani attempted to co-opt Subhas Chandra Bose into the pantheon of proponents of Hindutva. The appropriation of Subhash Chandra Bose by the BJP is a posthumous homecoming for a nationalist who believed in a synthesis of religion and nationalism, of the spiritual and the political. Subhas Chandra Bose was born on January 23, 1897 in Cuttack, Orissa. His father Janaki Nath Bose was a famous lawyer and his mother Prabhavati Devi was a pious and religious lady. Subhas Chandra Bose was the ninth child among fourteen siblings. To fulfill his parents wishes he went to England in 1919 to compete for Indian Civil Services. In England he appeared for the Indian Civil Service competitive examination in 1920, and came out fourth in order of merit. However, Subhas Chandra Bose was deeply disturbed by the Jallianwalla Bagh massacre, and left his Civil Services apprenticeship midway to return to India in 1921. In the early decades of the 20th Century, when others were looking up to Mohandas Gandhi for inspiration, Bose looked elsewhere. His search for a religious philosophy that would spur political activism led him to explore the teachings of Swami Vivekananda and the writings of Aurobindo Ghosh. The profound impact that Aurobindo Ghosh had on Subhash Chandra Bose is reflected in his autobiography: "In my undergraduate days, Aurobindo Ghosh was easily the most popular leader in Bengal... a mixture of spirituality and politics had given him a halo of mysticism and made his personality more fascinating to those who were religiously inclined... We felt convinced that spiritual enlightenment was necessaly for effective national service..." When he went to bed, he almost always kept under his pillow a small book — a pocket edition of the Bhagvad Gita. He was so steeped in its ethics and philosophy that he said: "How can I possibly accept Ahimsa as an inflexible principle of action, when Sri Krishna himself exhorted Arjuna not to run away from a righteous war, a dharmayuddha?" After returning to India Netaji Subhash Chandra Bose came under the influence of Mahatma Gandhi and joined the Indian National Congress. Subhas Chandra Bose was jailed during Civil Disobedience movement in 1930. He was released in 1931 after Gandhi-Irwin pact was signed. The Jugantar Party proved itself to be the most dangerous party in Bengal. Its record of achievement…was one which drew to it adherents in large numbers from all of Bengal. It also had the advantage over other terrorist parties of being the fighting force of Subhas Chandra Bose, who was more outspoken than any other Congress leader of Bengal in praise of terrorists and his demand for complete independence, which was the avowed object of the terrorist campaign. This advantage was great, for it opened out avenues of employment for terrorists in all institutions controlled by the Congress party and vast opportunities of recruitment. Subhas Chandra Bose protested against the Gandhi-Irwin pact and opposed the suspension of Civil Disobedience movement specially when Bhagat Singh and his associates were hanged. Subash Chandra Bose was soon arrested again under the infamous Bengal Regulation. After a year he was released on medical grounds and was banished from India to Europe. Defying the ban on his entry to India, Subash Chandra Bose returned to India and was again arrested and jailed for a year. After the General Elections of 1937, Congress came to power in seven states and Subash Chandra Bose was released. Shortly afterwards he was elected President of the Haripura Congress Session in 1938. In 1938 Subhas Chandra Bose served as President of the All-India Congress but, when re-elected in 1939, was virtually forced to resign after a clash with Gandhi and Nehru, who both distrusted his extremism. Subsequently Bose organized his followers into the “Forward Bloc,” which functioned as an opposition party to the Congress. Already at that time Nehru recorded his fear that Bose was turning fascist. In January 1941, after another arrest, Subhas Chandra Bose disappeared from his home in Calcutta and reached Germany via Afghanistan. Working on the maxim that "an enemy's enemy is a friend", he sought cooperation of Germany and Japan against British Empire. Bose was next heard from broadcasting for the Axis from Berlin.